Fitting Is A Science. Comfort is An Art. Nobody understands the art and science of fitting like we do. Our multi-disciplinary team has spent years combining the subtle art of comfortable fit with the precise science of foot measurement to guarantee a great fit for each & every purchase! Our fit recommendation offers the best size that fits your customer's foot. 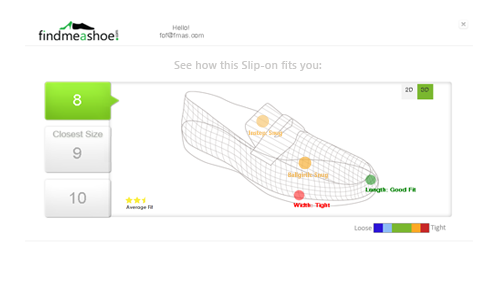 In addition to the size, Findmeashoe also offers Fit Quality Score and Color coded fit information. Fit quality score allows customers to compare different footwear models and sort them if required. Color coded fit information is the visual equivalent of trying on shoes. Our aim is to help shoppers make a purchase decision and provide post-purchase satisfaction. In other words, we help you sell satisfaction along with the shoes. Findmeashoe uses up to 30 data points to analyze both the footwear and foot before offering a size recommendation & fit information. Recommendation engine simulates the foot inside the shoe, both in a stable position as well as during entry/exit. Our patent pending algorithm uses not only dimensions but also the shapes and proportions which define both foot and footwear inner cavity geometry. Findmeashoe offers a mobile app technology for retailers to integrate into their current process. Shoppers need to take just 3 pictures of their foot, one time only, as the foot doesn’t change shape or volume for adults. This will be processed by our state-of-the-art AI enabled computer vision system to extract different information about the foot. All this happens in 10 seconds so your customer can shop instantaneously. Findmeashoe works with Manufacturers and Retailers to scan the styles in our warehouse. 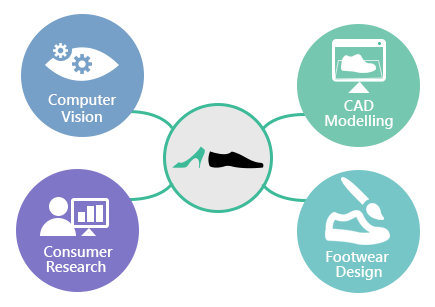 With shoe scanning, we capture accurate 3D geometry of the inner cavity of the shoes. This 3D model is later used by our services such as "Try Me" fit service or "Fit Studio" Design & QC services. The traditional shoe size scale uses a basic average measurement for sizing. We don’t—our process creates a personalized foot profile and matches it with an equally detailed shoe profile to provide the best shoe recommendations. We go beyond the basics—taking into account foot width, shape, height and more—to ensure the perfect fit every time. With our sophisticated Computer Vision approach, our process entails taking three simple pictures with a cellphone. We take it from there! In a matter of seconds, we create a personalized foot profile that can be saved for life—and instantly available whenever you shop! Our process mirrors the experience of physically trying on shoes by analyzing foot shape and proportion. With up to 10 separate measurements, our analysis measures each foot like a virtual custom shoemaker—with equally unique and comfortable fit results. We scan and model every type of footwear available to ensure customers have the selection they demand. Our process works no matter the style—sandals, boots, running shoes, and more—to eliminate the frustration of traditional size scales that does not account for the differences in shoe shape and construction. Our search engine eliminates the random nature of finding the right shoe fit. 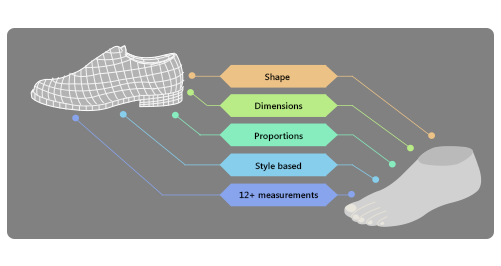 Instead of the traditional approach of offering any shoe based on an insufficient shoe scale number alone, our process instantly matches tailored foot profiles to shoe profiles and recommends the best fits by category. Our process saves time and reduces frustration by focusing on the best fit first. By sharing foot profile information with friends and family, buying shoes as a gift has never been better. Buyers need only select the profile of the desired recipient, and our recommendations remove the uncertainty of buying the wrong size. No more worries about fit. No more worries about returns. FindMeAShoe’s seasoned team of entrepreneurs brings their passion for new business strategies and opportunities to the online shopping environment. With broad, international experience in computer vision, product design, and business, together they have created a game-changing technological break-through for e-commerce in the footwear industry. 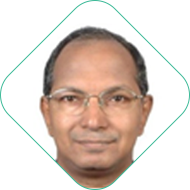 Anand Ganesan brings 15 years of chip design experience with major semiconductor companies like Intel Corporation, Philips, and similar entities in India. With additional experience in retail and supply-chain management, he focuses on business and technology development and oversees the day-to-day management of FindMeAShoe. PGPX, Indian Institute of Management-Ahmedabad, BE, University of Madras. 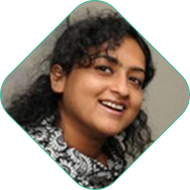 Utilizing eight years’ experience in UX, product design, and User Research, Shabari Raje focuses on FindMeAShoe’s product development and providing exceptional user experience for the firm’s e-commerce clients. MS, Domus Academy-Milan, BE, University of Pune. 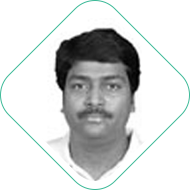 As CTO, P. Senthil Nathan brings key experience to the FindAShoe team, with 25 years of experience in deep Computer Vision and Product Development/Deployment. As an entrepreneur, he brings unique insights to establishing FindMeAShoe in the e-commerce space. MS, Stony Brook, BTech, Indian Institute of Technology-Madras. 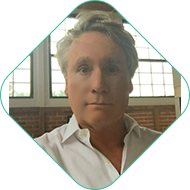 With 15 years in the footwear industry for major players like Nike, Stride Rite, and Keds, Steve Smith leverages his experience in retail, retail merchandising and buying, major account sales and management to provide business development. 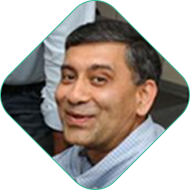 With over 23 years of chip manufacturing and design, supply-chain experience, and government, Mukul Kelkar focuses on long term strategy. With a background that includes Director of Strategic Planning at Intel Corporation, he contributes to the overall direction and guidance of FindMeAShoe. MBA, Kellogg School of Business, MS, Stanford University, BTech, Indian Institute of Technology-Delhi. Findmeashoe is proud alumnus of Target Techstars Retail 2017 Accelerator program. Throughout the program, Findmeashoe worked with several mentors, customers and testers to conducted trials that have enhanced usability, increased accuracy and app stability. We have launched our service in end of August 2017 and have initiated several pilots and technology evaluation projects with leading footwear brands.